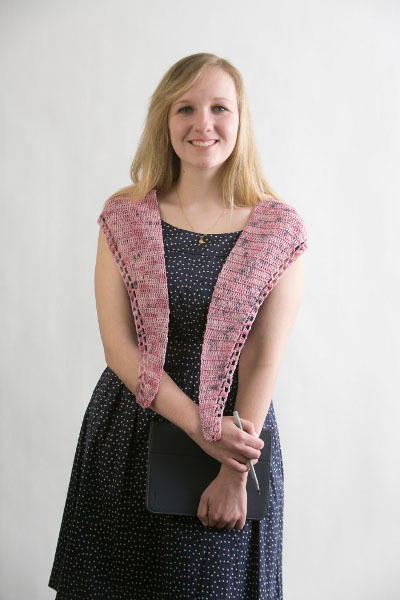 For this summer shawl, choose a lace weight yarn for a light shawl that can fit easily in a purse. 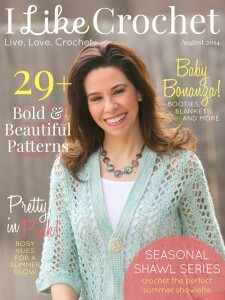 Be sure to keep an eye out for the fall-friendly shawl, next up in our October 2014 issue! 3 Stitch Cluster (3-st cl): Yo, insert hook in next ch-3 sp, *yo and draw up a loop, yo and draw through 2 loops,** yo, insert hook in same ch-3 sp. * Repeat from * to * once, then from * to ** once, yo and draw through all 4 loops. Double Crochet 2 Together (dc2tog): *Yo, insert hook in next st, yo and draw up a loop, yo and draw through 2 loops. Repeat from * once more. Yo and draw through all 3 loops. Double Crochet 4 Together (dc4tog): *Yo, insert hook in next st, yo and draw up a loop, yo and draw through 2 loops. * Repeat from * to * 3 more times. Yo and draw through all 5 loops. 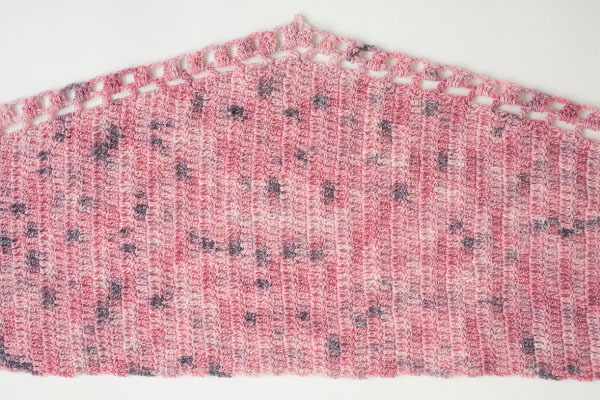 Rows 5-82: Repeat Rows 3 & 4 39 times, or until shawl measures approximately 30” (76.25 cm). Row 83: Turn, ch 2, pm around turning ch to mark center row, dc in same st and in each st across. Row 85: Repeat Row 3. Repeat Rows 84 & 85 until 4 sts remain. Row 1: Turn, ch 6 (counts as dc plus ch-3 sp), *skip next row, dc in side of next row, ch 3* to center marked row, (dc, ch 3, dc) in side of center row, ch 3, repeat from * to * to last st, dc. Row 2 (RS): Turn, ch 1, sc in first st, *ch 3,** 3-st cl in next ch-3 sp* across to center, ending last repeat before center at **, (3-st cl, ch 3, 3-st cl) in center ch-3 sp, repeat from * to * across, ending last repeat at **, sc in third ch of ch 6, fasten off.